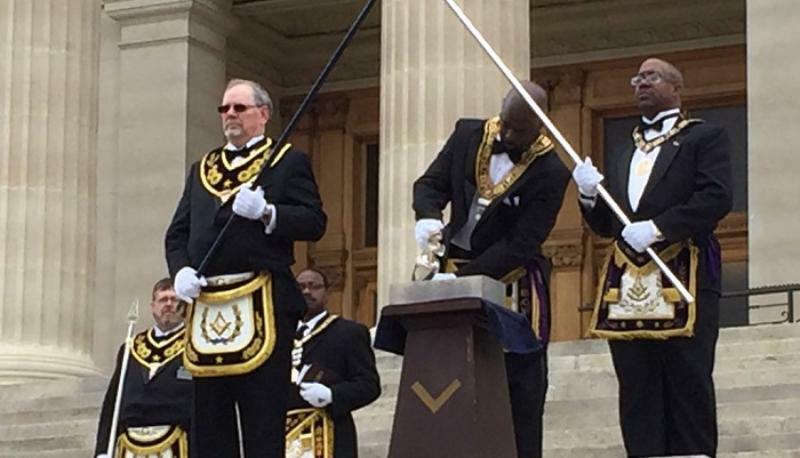 An estimated 150 Kansas Freemasons participated in a public cornerstone re-dedication ceremony at the state capitol building in Topeka today, in celebration of Kansas Mason Day. The building's cornerstone was placed at the Statehouse in 1866. Members, officers, and grand lodge officers from both the Grand Lodge of Kansas AF & AM and the MW Prince Hall Grand Lodge of Kansas F&AM jointly participated in the ceremony, and the famous George Washington Inaugural Bible was also on hand, on loan from St. John's lodge No. 1 in New York. As part of the festivities, it was announced that the Kansas Masonic Foundation of the Grand Lodge of Kansas AF & AM is donating $2.5 million this year to Kansas State University programs. Masons from 220 lodges in Kansas have donated a total of $2.5 million to three Kansas State University programs. "This gift is on behalf of Kansas Masons to benefit programs that are good for Kansans and Kansas communities," said Darren Kellerman, grand master of Kansas Masons. The Kansas Masonic Foundation's gifts will support the Kansas PRIDE program, the Center for the Advancement of Entrepreneurship and the Office of Military and Veterans Affairs. Kansas PRIDE encourages volunteers to work with local governments to improve their communities. The Center for the Advancement of Entrepreneurship works to improve entrepreneurial opportunities at Kansas State and throughout Kansas. The Office of Military and Veterans Affairs focuses on military-related institutional policies, education, research and outreach. "We are grateful for this significant partnership with Kansas Masons," said Kirk Schulz, president of Kansas State University. "Their generous investment will support K-State's outreach and service mission, which is part of our land-grant heritage and is key to becoming a Top 50 public research university by 2025. "Foundation president Michael Tavares says the organization wants to expand its partnership with the university through the three programs. "Last year, we awarded 78 scholarships to Kansas State University students. Now we are excited to expand our partnership with K-State through three truly unique initiatives," he said. The foundation also is celebrating its 50th anniversary by launching a $20 million fundraising campaign for community improvements. "As I stand here in the middle of America, on a beautiful Kansas spring day, on the steps of our State Capital, under the eye of an all-seeing God, I tell you that we as Freemasons do not specifically identify who that Grand Architect is, as we believe each person has the right and ability to worship who they choose and how they do it. Similarly, we do not allow the discussion of religion or politics in our meetings. In our Fraternity we are not concerned with such matters, nor do we care about a person’s nationality, race, their social standing, or their sexual orientation. We only ask that our members be persons of an upstanding nature and believe in a Supreme Being. Yes we are of a charitable nature, and strongly believe in helping those in need. 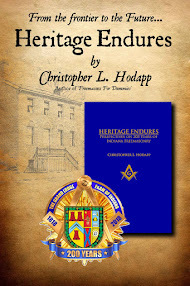 These are some of the basic principles that our Country and our State were founded upon and why freemasonry and its’ ceremonies are deeply interwoven in our history." I am feeling extremely proud today to be both a Mason and a Kansan. In a time of divisive and Fear-based Politics my Masonic Brothers from across the State of Kansas have demonstrated once again how the Kansas Free-State can show the country the way things ought to be in over-coming racial prejudices and divides. First, Kansas being admitted to the Union as a Free-State Jan 29th 1861, an act that precipitated the Civil War. Then May 17th, 1954 it was a Court case from Kansas, Brown vs Topeka Board of Education that ended Public School Segregation in the United States. March 18th 2016, many across Kansas and the country were unaware of what took place in the State Capital of Kansas. The State Capital building was dedicated 150 years ago by Kansas Masons and yesterday re-dedicated by Kansas Masons, this time however by Masons that were traditionally divided along racial lines together as one group. The Governor of Kansas issued a proclamation calling March 18th, Kansas Mason Day. And what better way to celebrate it than rededicating the State Capital in an act of Unity and Solidarity. Kansas, that often mocked farm State, making history again. A show of solidarity. 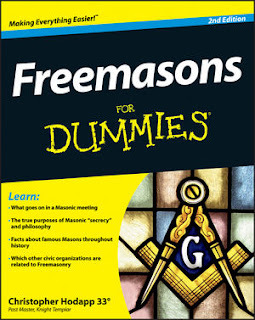 Now this is what Freemasonry should be about.